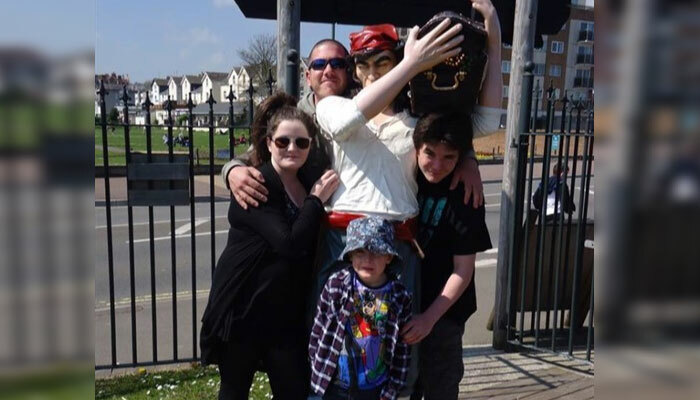 My name is Nat Mitchell, over the Easter period myself and my amazing family came on holiday to Devon courtesy of THHN (Torbay Holiday Helpers Network. As residents from the other side of the Tamar this was indeed a journey to the dark side after all you guys definitely don’t know how to eat cream teas ;-). We stayed at Finlake holiday park in the Memory Maker caravan donated by the Miss England organisation, and visited lots of attractions throughout Paignton, Babbacombe and Torquay. This was all provided free of charge by the supporters of THHN and how welcome we were made! Our son was greeted like a hero on the Babbacombe Cliff Railway down to the beach, treated as a special guest at the Angels Tea Rooms. He even received a proposal when we dined at Hanbury’s as their special guests, where we had the best fish and chips of our lives. Our daughter was a made a guide around Kent caverns where our amazing guide kept us all enthralled. We had great fun at the jungle and pirate pitch and putt. For me the highlight was seeing our son Finn ride down the water flume at Woodlands, not such a big thing for most 5 year olds, but almost 4 months ago to the day our son was fighting for his life as on the 12th December 2013 he was diagnosed with a life threatening brain tumour and our lives were shattered in an instant. We rushed to Frenchay in Bristol where Finn had surgery, he fought for his life for four days we truly believe that Finn knew his life was worth fighting for and he has astounded the medical profession with his recovery. He still has some issues but he is awesome. When we were given the holiday by THHN we were in a whole world of pain, we never knew we needed this holiday as much as we did. Last week we laughed, we loved and we filled up the bank of good times, we were treated so kindly by the people of Torbay and Devon and we as a family would like to say thank you. Thank you to Luke and THHN for having us to stay at the Memory Maker caravan we have topped up the bank of good times. Giving kids and their families good memories through hard times can make the difference between falling apart and marching on, as a parent you always march on but when even complete strangers have your back it provides you with a little more strength.